Tuesday, January 6, 1914: Nothing much doing. It’s cold here! I like to make old-fashioned hearty soups, like Rivel Soup, on icy days like today. I wonder if the Muffly’s regularly ate soup during the winter months. Here’s an old recipe of Rivel Soup. It is a potato soup with small dumplings (rivels). My family often ate this soup when I was a child. I didn’t like it back then, but now my husband and enjoy this nuanced and mild, yet delectable, soup. Put the diced potatoes in a large saucepan and just barely cover with water. Cook diced potatoes in water until soft. Add butter and milk. Meanwhile, to make rivels, combine flour and egg in a bowl. Drop rivels, which are no larger than a raisin, into the boiling potato mixture, while periodically stirring to prevent the rivels from sticking together. Cook 5 minutes. Add cream and salt to taste; reheat until hot. Put into serving bowls and garnish with bacon. Posted on January 6, 2014 August 30, 2015 by SherylPosted in Food, recipesTagged soup. Sounds perfect for days like these! That soup sounds like the perfect thing on a cold evening… Cheers! Oh, I like the sound of that. I’ll make it the next really cold day we have. We have a family recipe that is much simpler. It is simply an egg, flour and milk. Mix the egg and flower together and make tiny lumps and then crumble into hot milk. Sounds good – just what’s required on a cold winter’s day. Potato soup is my favorite; I’ve never heard of rivels! Cold weather ahead for us: Might just be the time to try this. I will have a bowl, too. Thanks. How lucky you are to have your grandmother’s diary! Yes– hot soup on these cold days is a must! Your posts often bring back memories of my own childhood tucked back in the brain stem apparently. Mmmm…potato soup. I love potatoe soup! My grandmother made it fried onions and spicey sausage all blended together once the potatoes were cooked. Warmed the tummy and the spices made me sweat! Good idea, I am going to make the potato soup and add my left-over turkey soup. Yes!!!! I will be making this on soup Thursday. Yumm! This recipe evokes memories of my central PA upbringing. I don’t think I’ve ever seen it (rivel) spelled out, though! It’s somehow disconcerting to see a word that I have only heard spoken. It does sound good. I have a few potatoes around, but no cream. It is cold here in Atlanta too! This soup sounds delicious Sheryl and would be very welcome on a cold winter’s day. Perhaps Helena was bored because it was too cold to go outdoors. Is the flour used plain or self rising? I just used regular all purpose flour. I enjoyed reading your description of how you make the rivels. 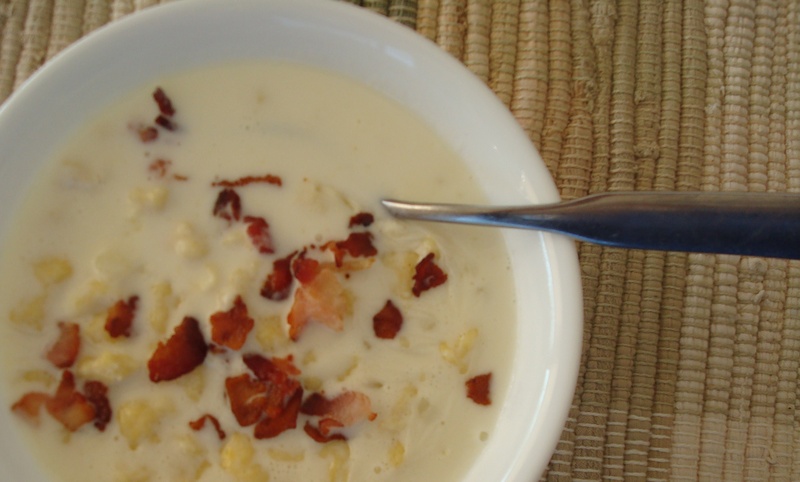 Old-time foods, like rivel soup, have so many wonderful variations. I love soups and l would happily give this one a try, it sounds lovely. I am fascinated by the past, including what people used to eat, your blog is brilliant. It’s a wonderful soup – and perfect for a cold winter day. It’s nice to hear that you enjoy this blog.